What is FraudWatch and How Does it Work? 3dcart's Fraudwatch Program is a special service which actively collects data points associated with your store's orders to provide you with a fraud risk score on the order itself. The information collected includes certain attributes like the shopper's IP address, banking information, mailing address and other factors which are then weighed to provide the risk score. The order is at high risk for being fraudulent and you should carefully consider whether to process it or not. How do I check an order's FraudWatch score? When viewing an individual order in your 3dcart Online Store Manager, you will see a section towards the top of the that contains the order's FraudWatch Data. Click on the refresh icon as shown below. The "Community Alert" feature is an additional component of the FraudWatch Program which links to a collective database of any shoppers the 3dcart merchant community (your peers) have ever reported as fraudulent. 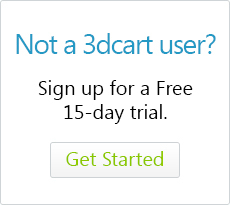 If a specific shopper's order is ever reported as fraud by you or any other 3dcart FraudWatch user, the community alert will list this on any subsequent orders that the shopper places on any 3dcart powered store thereafter. This is a great way to help you and your fellow merchants remain aware of repeat offenders. Best of all it's free! Fraudwatch is free to try, allowing you to view 1 Fraudwatch call per month. After clicking on the upgrade link, you will be presented with the following screen that will allow you to select and update your plan as desired. What if I don't want to use FraudWatch on my store? You can also use the same steps outlined above to turn on Fraudwatch at your leisure.